The Vatican City is the smallest state in the world but it is rather impossible to describe in a few words all the art treasures displayed in it. As a State, it mints its own coins, keeps its own army of Swiss Gards and prints its own stamps. Its position of a State within a State was guaranteed by the Lateran Treaty of 1929. The Vatican has a daily newspaper (L'Osservatore Romano), a post office, several shops, a radio, (the Vatican Radio, broadcasting to the world in over 20 languages). 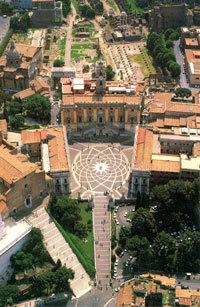 This small state grew around its most important feature and centre of the Catholic faith: St Peter's Basilica. This magnificent basilica, drowing pilgrims from all over the world, lies above a former shrine, which is said to mark the burial ground of the Saint. A first great basilica was ordered by Emperor Constantine and completed around AD 349, but in 1506, despite the building venerable age of about 1000 years, Pope Julius II pulled down the original structure, laiding the first stone of a shiny new basilica. Construction lasted 120 years; all the great architects of the Roman Renaissance and Baroque (including Alberti, Bramante, Raphael, Peruzzi, Sangallo the Younger) had a hand in its design. Michelangelo was responsable for the huge dome and the supporting drum; the two minor cupolas were designed by Vignola, the façade by Maderno, the colonnade (and the canopy of gilded bronze inside the basilica) by Bernini. The basilica interior is a display of the power of the Church: in the first Chapel on the right lies Michelangelo's Pietà (1498-9); Arnolfo da Cambio's bronze statue of St. Peter (1296) has become famed for its foot, worn to a nub by pilgrims' kisses. Bernini's Throne of St. Peter (1665) above the papal altar, dominates the far end of the nave. The Vatican Museums house one of the world's most important art collection and alone could easily eat up a day or two of a trip to Rome. Highlights include the Raphael Rooms, the Etruscan Museum and the Pio-Clementino Museum (containing the world's largest collection of Classical statues). The walls of the Sistine Chapel, the main chapel in the Vatican Palace, were frescoed by some of the finest artists of the 15th and 16th centuries (Perugino, Botticelli, Ghirlandaio, Signorelli). The decoration of the chapel walls was completed between 1534 and 1542 by Michelangelo who added the great wall fresco The Last Judgement. Distance from Residenza Giubbonari: five bus stops. Trevi Fountain is probably the nicest fountain in the world, that's why it has been the star of many films set in Rome (among the most important: Three Coins in a Fountain, Roman Holiday, La Dolce Vita). 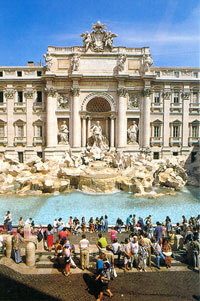 According to tradition, if you throw a coin in this fountain, you are sure you will come to Rome again. The fountain history dates back to Ancient Rome; the site originally marked the terminal of the Aqua Virgo aqueduct built in 19 BC. Trevi Fountain was rebuilt several times until its final Baroque version (completed only in 1762) by the architect Francesco Salvi. Pope Sisto IV della Rovere (reigned 1471-84) ordered to build a church to the Holy Virgin if she would bring the war with Turkey to an end. This is what happened and peace being restored, this church was erected and named "St. Mary of Peace". 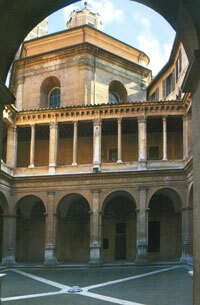 In 1504 a cloister was added by Bramante and in 1656 Pietro da Cortona added a charming semi-circular portico. The church interior houses Raphael's famous frescoes of four Sybils. Also did some work for the church: the architect Antonio da Sangallo (designed 2nd chapel on the right), Baldassarre Peruzzi (fresco on 1st chapel on the left) and Timoteo Viti (a Raphael's pupil, who painted che Prophets fresco). 6' walk from Residenza Giubbonari. The name "Trastevere" comes from the latin Trans Tiber, across the Tiber. It is one of the most pitoresque old quarter of the city, where the "Roma sparita" (the colourful 17th - 19th century Rome embedded in human qualities that vanished) is still somehow in the air and in everybody's memory. Anyway it's possible to glimpse scenes of everyday life that seem to belong to bygone centuries. The inhabitants of this area consider themselves the most authentic Romans. The proletarian character of the place made it traditionally the beloved quarter of the artists. It is may be the Capital's best area to enjoy nightlife with its fashonable restaurants, boutiques, characteristic cafés and clubs. Some of Rome's most fascinating medieval churches lie here, hidden away in the patchwork of narrow cobbled backstreets. Among the most important: Santa Cecilia, San Francesco a Ripa and Santa Maria in Trastevere. Rome's most beautiful Baroque Piazza was built on the top of the ancient Stadium of Domitian (that seated about 45,000 spectators) in which were held athletic contests called agones. The Stadium was stripped of its marbles in AD 356 by Constantinus II on a visit to Rome and by the 5th century it was in ruins. It came to life during the Renaissance when, in the second half of 15th century the market from the foot of the Capitol was moved here. The Piazza still mantains the elliptic shape of the Roman Stadium, but its unique appearance and atmosphere were created in the 17th century with the addition of the Fontana dei Quattro Fiumi (Rivers Fountain) and the Church of Sant'Agnese in Agone as its focal points. 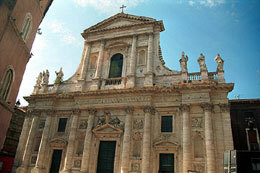 Most of the piazza finest buildings date the reign of Pope Innocent X (1644-1655). 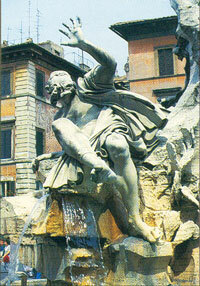 The River Fountain was designed by Bernini as a base for the Egyptian obelisk which once stood in the Maxentius Circus. The great rivers (the Ganges, the Danube, the Nile and the River Plate) are represented by four giants. According to a legend, the veyl on the Nile Giant conveys Bernini's dislike for the nearby St. Agnes in Agone church, designed by his rival Borromini, while the figure of the River Plate, cringing with arm upraised, express Bernini's fear that the church will collapse. The Church of St. Agnes in Agone, a magnificent example of Baroque building, made by G. Rinaldi and Borromini, was commissioned by Pope innocent X in 1652 on the site of the brothel where, in AD 304, the young Agnes was exposed naked to force her to renounce her faith. Within the church, in the basement, you will see the ruins of the Domitian's Stadium. A marble statue of the Saint on the façade is said to be reassuring the Bernini fountain that the church is stabile. Up until the 19th century the Piazza Navona was partially flooded during August by stopping the fountain outlets to accomodate water games. Next to Piazza Navona, inside Palazzo Altemps (Piazza Sant'Apollinare, 46) the Museo Nazionale Romano houses an extraordinary collection of Classical sculptures. The best preserved and most beautifully proportioned of Rome's ancient monuments, the Pantheon has become an emblem of the city. Through a portico consisting of three rows of eight columns (14mt. / 46 ft high) and great bronze doors, you enter in a huge circular room with floor made of porphyry, granite and other marbles. 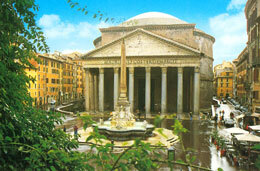 Built by Hadrian between 119 - 128 AD, this roman temple "of all gods" is an engineering marvel of the Romans. 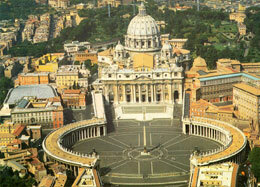 It has the largest dome in Rome (larger than St. Peter's) with its radius exactly equivalent to its height. A 9 mt. (30 ft) hole, called oculus, in the dome's centre, provides light (and rain too!) for the building. The Pantheon became a Church in the Middle Age and is now also a national monument, hosting the graves of the great painter Raphael and of the former Italian Royal family. 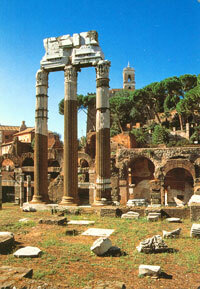 The Roman Forum was the centre of political, commercial and judicial life in ancient Rome. It covers a large area. Actually there are two forums: the proper Roman Forum (Monarchic and Republican period of Ancient Rome) and the Imperial Forums (of Emperors: Trajan, Augustus and Vespasian). When Rome's population boomed and the first Forum became too small, Julius Caesar ordered (in 46 BC) to built a new one next to the temple of the Goddess Venus Mother, from which his family was said to descend. The Imperial Forums were built afterwards, obscuring the splendor of the Roman Forum. 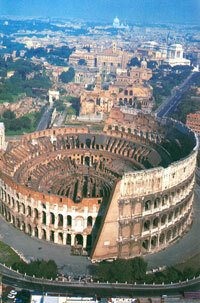 In AD 113 the Forums were in number of five and covered over 90,000 sq. metres. The largest buildings were the basilicas (Basilica Julia, Basilica Aemilia, Basilica of Constantine and Maxentius) where legal cases were heard. Emperors erected in the site columns and triumphal arches to themselves (arch of Septimius Severus, arch of Titus, of Constantine, column of Phocas, Trajan's column) Emperor Vespasiona erected there the Colosseum. In the middle of the Forum lies the oldest street of Rome, the Via Sacra (the Sacred Way), the route followed throught the Forum by religious and triumphal procession towards the Capitol. Both the Via Sacra and Via dei Fori Imperiali comprehend along their way several remains of other important Roman buildings such as the Temple of Saturn, the temple of Castor and Pollux, the Temple of Vesta, the temple of Antonino and Faustina, the temple of Romulus, the temple of Venus and Rome, the Curia, the House of the Vestal Virgins and the huge Trajan's Markets. The temple of Jupiter on the Capitol (the southern summit of the Capitoline hill) was the centre of the Roman world. It was the scene of all the most sacred religious and political ceremonies. The hill and its temple came to symbolise Rome's authority as caput mundi (head of the world), and the concept of a "capital" city is derived from the Capitol. The present arrangement on the hill dates from the 16th century when Michelangelo was asked by Pope Paul III Farnese to renew and embellish the site. A broad flight of steps, the "Cordonata" (with the Classical statues of the Dioscuri, Castor and Pollux at its top and a pair of Egyptian lions at the foot) leads up to the spectacular Piazza del Campidoglio. Both the geometric paving and the façades of the buildings (Palazzo dei Conservatori, housing the Capitoline Museums with a fine collection of sculptures and painting, Palazzo Senatorio and Palazzo Nuovo) were designed by Michelangelo. On the northern summit of the Capitoline, on the site of the ancient Temple of Juno, stands the Church of Santa Maria in Aracoeli (St. Mary of the Altar of the Sky) dating from the 6th century. It is famous for the icon of the Santo Bambino (Holy Child), a 15th century olive wood figure, carved out of an olive tree from the Gethsemane garden in Gerusalem, that is said to have miraculous power. The 22 columns inside the church were taken from various ancient roman buildings; the third column to the left comes, as its inscription sais, "a cubiculo Augustorum"(from the bedroom of the Emperors). This church has been used to celebrate many triumphs over adversities occurred in the past times. In the first chapel on the right, frescoes (about 1480) by Pinturicchio. The Church is approached by a Staircase (Scalinata dell'Aracoeli) completed in 1384 in thanks for the passing of the Black Death and becoming soon a centre for political debate. According to the popular belief, by climbing the 122 marble steps on your knees, you can win the Italian national lottery. Rome's greatest amphitheatre was commissioned by the Emperor Vespasian in AD 72 on the marshy site of a lake in the grounds of Nero's Palace, the Domus Aurea. Deadly gladiatorial combats and wild animal fights were staged free of charge by the emperor for public viewing. The Colosseum is a building of great beauty; the outer walls were made of travertine; it had 80 arched entrances allowing easy access to 55,000 spectators. Despite being damaged over the years, it remains a majestic sight. The Colosseum may have acquired its name from a huge gilt bronze statue (the Colossus of Nero) that stood near the amphitheatre. Shaped like a crooked bow tie and surrounded by tall shuttered houses, Spanish Square, is crowded all day and most of night. In the 17th century Spain's Ambassador to the Holy See had his headquarters on the square and the area around was deemed to be Spanish territory. During the kingdom of Louis XIV of France, the French, owners of Trinità dei Monti (church,16th century), decided to link it with Piazza di Spagna by building a magnificent new flight of steps, planning to place an equestrian statue of the French king at its top. 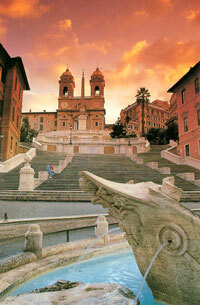 Arguments with the Vatican (not too happy to have a huge statue of a French monarch in Rome) continued until 1721, when the Italian architect Francesco De Sanctis produced a design of the "scalinata della Trinità dei Monti" (Spanish Steps) satisfying both parties. The steps were completed in 1726. They are now a popular meeting point. Just in front of the steps there is the Barcaccia fountain similar to a half-submerged boat and Via dei Condotti, home to the nicest clothes, leather goods and shoe shops. All the well-known stars of the Italian Fashion scene (such as Missoni, Valentino, Armani, Fendi, Gucci, Ferré, Dolce e Gabbana, Biagiotti , Trussardi etc), plus exclusive jewellers, gift shops , shoe designers and tailors are concentrated in this area, the best shopping district in Rome. In the 18th century this area was full of hotels for frivolous English aristocrats, artists, composers and writers, whose favourite meeting place was the Caffé Greco, (via dei Condotti 86), opened by a Greek in 1760. Keats, Byron, Goethe, Canova, Liszt, Wagner, Bizet, and the mad Prince Ludwig of Bavaria breakfasted and drank in this café, whose walls are studded, today, with portraits of the cafe's illustrious customers. 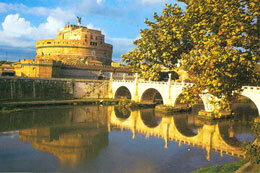 The massive Fortress of Castel Sant'Angelo was built in AD 139 as Emperor Hadrian's mausoleum. Begun by the Emperor, it was finished four years later by his adopted son and successor Antoninus Pius. The fortress was crowned by a statue of the Emperor and a bronze quadriga. Since then it has had many roles: as part of the Emperor Aurelian's city wall (AD 270), as medieval citadel and prison and as residence of the popes in times of political unrest. The Vatican Corridor, leading from the Vatican Palace to Castel Sant'Angelo was built in 1277 to provide an escape route when the Pope was in danger. The fortress takes its name from the vision that Pope Gregory the Great had of the Archangel Michael on this site. The lively piazza of Campo de' Fiori owes its name to the "flowers field" present here before the erections of the buildings in the first half of 15th century. But, also, its name is said to derive from Campus Florae (Flora's square), Flora being the lover of the great Roman general Pompey. 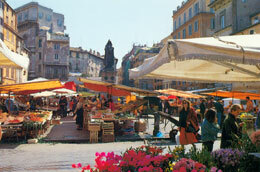 Campo de' Fiori is today one of the most characteristic places in Rome and has a very romantic atmosphere. It hosts in the morning (except Sunday) a colourful flower, fruit and vegetables market: this is Rome's most picturesque and historical market; wondering among its stalls it's a pleasure and an inspiring experience. In the afternoon the square becomes an intriguing meeting point. At night it is one of the most attractive places, with many good pizzerie, restaurants and café's with people engaged in lively conversations, rekindling the unique Roman atmosphere of love for life. In the past, this wide place was perfectly suitable for feasts, processions and any kind of races, but it was also selected as a tortures and capital punishments venue. So, despite its poetic name and its amiable look, the square was a site of assassination too. The philosopher Giordano Bruno was sentenced and burnt alive here by the Inquisition on February, 17, 1600, right in the place where his statue stands today. The Church of St. John of the Florentines was built for the large Florentine community living in this area. Dedicated to St. John Baptist, the church was commissioned by Pope Leo X from the Medici family (reigned 1513-21), who wanted it to be an expression of the cultural superiority of Florece over Rome. Works started in the early 16th century and the church was finished in about 100 years with the contributions of Antonio da Sangallo, Sansovino and Della Porta. Maderno's cupola was completed in 1620. The spectacular high altar houses a marble group by Antonio Raggi: Baptism of Christ. The altar itself is by Borromini, who is buried in the church along with Carlo Maderno.